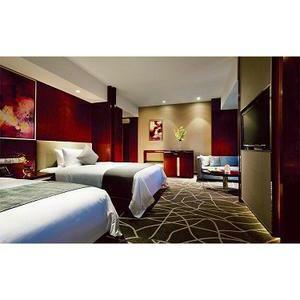 预定房间可以用Booking Room来表达，比如客户订房前，通常会访问旅行消费类网站，对当地酒店做横向比较，择优选择最好的酒店要怎么说呢，可以这样，Before booking room,the customer usually visit those popular travel website,they would makes some horizontal comparison to the local hotel,and choose a best hotel，又或者，我上周在这家酒店预订了房间，不是吗英语怎么说，可以这样，I had a booking for a room here at your hotel last week,right? Mary:We want to book two rooms. R:Ok,then,would you like two double rooms or one double room and one single room? Jane:One double room and one single room. R:Ok.May I have your names? R:Thank you,Mary White.Then how about you,the other lady? Tom:This is my wife.My name is Tom Smith.T-O-M S-M-I-T-H.
R:Thank you,Mr.and Mrs.Smith.Wait a moment,please. (After a few minutes)I've got it.Your room numbers are 401 and 402.401 is a single room,and 402 is a double room. Operator:Hold the line and let me transfer to the front desk for you.请不要挂电话，我帮您转接总台. --Good morning!Room reservations,may I help you? --Yes,I'd like to reserve a room. --Thank you,sir.For which date and how many person will there be in your party? --From April,16th to 20th.Just my wife and myself. --From April,16th to 20th.And which kind of room would you prefer,sir? --Could you hold the line please.I will check our room availability.Thank you for waiting sir.We have a twin room at 180 dollars per night.Would that be all right? --Thank you,sir.May I have your name and phone number,please? --Sure,my name is Aron Johnson.My phone number is 32425827. --Mr.Aron Johnson.Phone number is 32425827.Excuse me,how do you spell your first name? --Double A-r-o-n.Thank you Mr.Johnson.May I know your arrival time on April,16th. --Mr.Johnson.For the unguaranteed reservation,we can only hold the room by 6pm.Because it is the peak season now.If you make the guaranteed reservation,we can hold the room overnight.Would you like to make a guaranteed reservation by credit card? --Fine,do you accept American express? --Yes,may i know the number? --Thank you Mr.Johnson.You've made guaranteed reservation in Guozhou Hotel.From April,16th to 20th for five nights.If you can't arrive at scheduled.Please inform us before 6pm on April,16th.Thank you for calling.And we look forward to serving you. A:Hello.What can a do for you? B:I want to book an room. A:Oh,Which floor do you prefer?5th or 6th? B:I think 6th floor is better. A:Room 603 is free.Do you think that room is OK? A:Please show you ID card. A:OK.Will you have a breakfast? A:OK,this is your ID card and the key for the room. A:There is the lift.Have a good night. Reservationist(R):Good afternoon.What can I do for you? Client(C):Good afternoon.I&rsquo;m calling from Beijing Foreign Trade Company.Is it possible for me to have a suite? R:Certainly,can you give me your name please,sir? R:Thank you,Mr.West.But by the way,how long will you stay here? C:I&rsquo;ll stay here for quite a long time. C:How much is the suite,please? 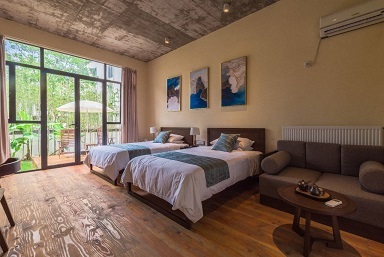 R:Your suite is 320 yuan(RMB)per day. R:Three hundred and twenty yuan a day,service included. C:What services come with that? R:For three hundred and twenty yuan a day,you will have one bedroom with air-conditioning,a sitting room,a bathroom,a colour TV set,a telephone and a major international newspaper delivered to your room every day. C:Do I have to pay in advance? R:Yes,you may pay half of it.The account will be settled later. C:On which floor is the suite? C:What&rsquo;s the difference between them? C:Which is quiet?I want a quiet one.I hate noise at night. R:The one on the thirteenth floor is very quiet.The room number is 1316. R:OK.And your arrival and departure dates? C:I don&rsquo;t know,but it could be seventeen to twenty days. R:Then we can only confirm a room from the 10th to the 27th.I&rsquo;m afraid we won&rsquo;t be able to guarantee you the room after the 27th. C:What if there isn&rsquo;t any room then? R:Don&rsquo;t worry,sir,We can either put you on a waiting list or find you a room in a nearby hotel. A.I will be staying in Paris for several days.Can I book a room for December 27th? B.Sure,what kind of room would you like,Monsieur? A.I want a double room,the queen-size bed. B.One moment please.I&#39;ll just have a look.Yes,we have got a double room on that date.So,how long will you be staying with us,Monsieur? A.I&#39;m not sure.At least five days,but it could be longer. B.That&#39;s no problem.We will make a reservation for December 27th.Just let us know if you need to extend your stay. A.Is the room with or without a bath? B.It&#39;s a room with shower and toilet,Monsieur. A.How much will the fee for one night? B.It includes morning newspaper,continental breakfast and service. A.Is there an extra charge for children? B.If the children is under sixteen and need put an extra bed in your room,the charge is seventy-five francs.Do you want the room? B.May I have your name and phone number,please? A.Phillip,Bartley.My phone number is 619-930-7185. B.Will you be using a credit card or will you pay when you check in? A.Thank you,you have been most helpful. A:Good morning.This is Room Reservations.May I help you,sir? B:Yes,I'd like to reserve a room. A:How many guests will there be in your part? B:Just my wife and myself. A:Which kind of room would you prefer,a double or twin? A:Could you hold the line,please?I'll check our room availability for those days.Thank you for waiting,sir.We have a twin at HK$1 000 and at HK$1 500.Which would you prefer? B:We'll take the one at HK$1 500. A:Certainly,sir.May I have your name and initials,please?